A good pair of waders can be the difference between spending the day with boots full of mud or with dry toes. This article will offer answers to your questions about selecting the right waders to get the most out of your experience on the water. There are several different wader designs available to anglers today, each with their own advantages and disadvantages. Depending on the kind of fishing activity you are involved in or the type of water you fish most often in, you might prefer one over another. The most common types you will see in fly shops and tackle stores are hip waders, waist high waders or wading pants, and chest high waders. Hip waders are typically the least expensive and most convenient type of wading system available. They are a dream for the casual fisherman who prefers to stay in shallower water and appreciates the convenience of having the boot and wader attached to one another. Basically, they are a pair of wading boots with a waterproof fabric upper section that reaches up to hip height, fastening to the belt. As long as you dont need to wade very deep and arent relying on them for warmth, they are a great option. Waist high waders work like a pair of waterproof pants, only differing from chest waders in that the waterproof material does not reach above the waist. The main advantage is that they are easier to put on and remove and help you stay cooler on hot, sunny days. This style of wader is preferred by anglers who mostly fish during warmer months or in hot climates. By far the most common style of waders, chest highs are the most versatile and best all-around choice if you dont mind spending the money. They can certainly be used for shallow wading and in warmer weather, but they also allow for deeper wading and provide anglers with the added weather protection needed for fishing in colder climates. Waders can be made of any waterproof material, from rubber to waxed canvas, but the most popular and common choices you will see are either neoprene or lightweight, breathable fabrics such as GoreTex. You may see other outdated materials on sale in discount bins or at thrift stores, but you are better off spending the money on more modern and durable materials. Neoprene has been a top choice for wader materials since the 1970s and still has its following. Neoprene waders are lightweight, flexible, and  best of all  warm. For anglers who fish in cold weather, its hard to beat neoprene. They are also typically much less expensive than breathable waders. Neoprene comes in different thicknesses, from 2 mm up to 7 mm. The thicker the material, the warmer it will keep you. However, be aware that thicker neoprene is bulkier and less flexible. One disadvantage is that the material tends to degrade over time and become brittle, decreasing the useful life of the wader. Gore-Tex, Toray, or other fabrics marketed as being waterproof and breathable are becoming the most popular option for fishing waders, and for good reason: they keep the water out while simultaneously allowing sweat and moisture to pass through. This attribute makes breathable waders extremely versatile. Like modern ski clothing, you can simply add or remove layers underneath to stay as warm or as cool as you like. You will often see breathable waders marketed in different thicknesses. However, with breathable waders, the thickness is measured in terms of layers and has more to do with the durability of the material than warmth. Five-layer Gore-Tex is thicker and more durable than three-layer, so it is important to take material thickness into account when selecting a pair of breathables. You will often see waders in this style with more layers on the lower legs and less layers on the chest since the lower portion of the wader is the most likely area subjected to wear and tear. It is also important to pay attention to the fabric itself, which is typically a heavy nylon. Higher end waders will be made of thick, heavy-duty nylon while cheap waders consist of paper-thin nylon that is prone to tearing. 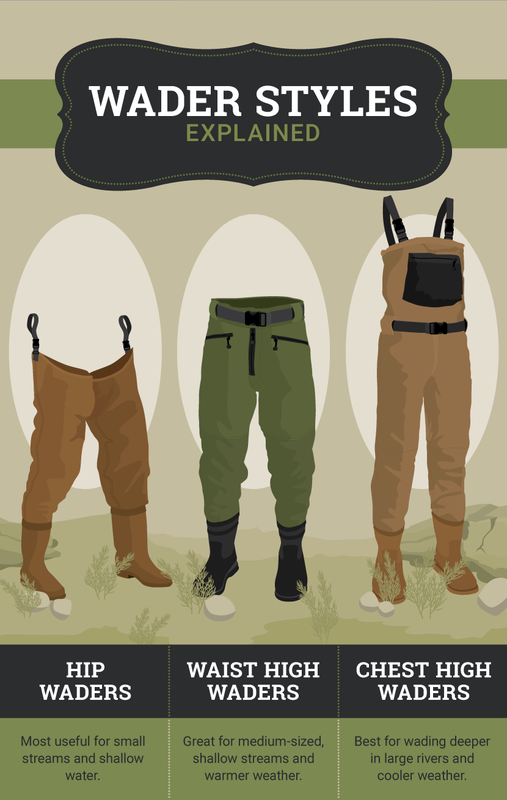 Waders can be sold with the boots attached, but, these days, it is more common to buy what are called stockingfoot waders and purchase a separate pair of wading boots to wear over them. The waders are waterproof by themselves, but the boots are necessary to protect your feet and provide traction in the river. While comfort, fit, and support should all be considered when purchasing boots, one of the most important aspects to scrutinize is the sole material. Wading boots can feature felt soles, rubber lug soles, or either material with accompanying metal studs. Felt has been the standby material on wading boot soles for generations due to its exceptional ability to grip slippery, wet surfaces. This material performs amazingly in rivers where the bottom is sand, gravel, or small- to medium-sized rocks and can be the best bet if there is a lot of slime or algae in the river. However, felt does have its disadvantages. It wears out quickly and has very little traction when walking on trails or muddy banks outside the river. Despite this, felt is still considered the best material for traction while wading and should be your first choice if you are concerned about your stability in the river. In the last few years, more and more companies are manufacturing boots featuring Vibram rubber soles with aggressive tread patterns. 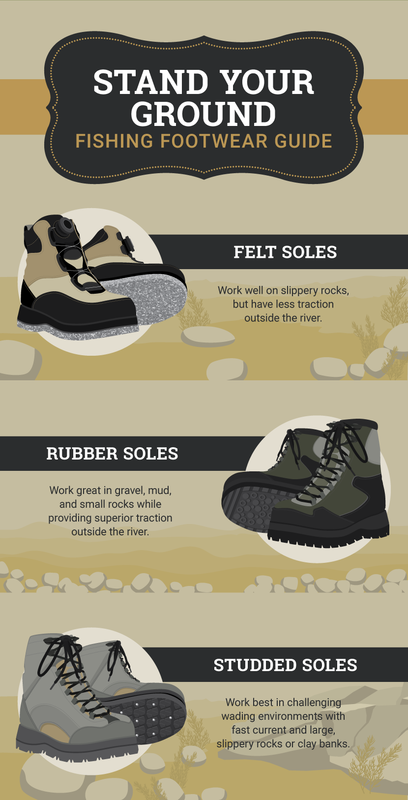 While these soles do not provide quite the same traction on slippery rocks as felt, they offer the versatile advantage of being a far better sole for hiking and walking around outside the river. Rubber soles are a great option for anglers that like to roam or hike during their fishing day and are willing to sacrifice a bit of grip for a more durable and versatile sole. In addition, certain states, such as Alaska, have banned felt soles for environmental reasons, making rubber the most logical option for traveling anglers. Studs are small metal cleats or spikes that can either be sold already installed in a boot or bought separately and added to the sole later. Studs increase the amount of traction the sole has on certain surfaces and, in general, will help anglers with their stability in the river. For deep rivers with strong currents or very slippery surfaces, studded soles are highly recommended. Fishing stores often carry several different models of waders that may range in price from as low as $100 to as high as $800. With so many options to choose from, how do you pick the one that is best for you? The most important things to consider are the durability of the wader, amount of time you plan to spend on the water, and environment you will be fishing in. A good pair of waders can last one angler a lifetime and another angler only a few years. It depends on how much you fish and what you are doing while out on the water. If you spend your time plowing through blackberry bushes, scrambling over boulders, hopping barbed wire fences, and straying far from the beaten path, then spending more on an expensive pair of breathable waders is probably worth the investment. However, if you only fish occasionally and prefer areas close to where you park your car, then durability will not be as much of a concern. Breathable waders are currently the most durable available on the market, and, in general, the more you spend, the more life you can expect to get out of the wader. Waders will wear out and leak eventually  there is no way around it  but when that happens will vary widely based on the wader you buy and how much you fish. If you plan to fish over one hundred days a year, buy the best set of waders you can afford. On the other hand, if you only fish once a year or occasionally on weekends, then you might be better off saving the money and using it to hire a fishing guide or for buying bait! When it comes to choosing the right style of waders, consider the places you like to fish. Do you fish in mostly small streams that you can hop across? Go with a pair of hip waders. Like to wade in medium-sized meadow streams and cow pastures in Montana during the summer? Waist highs will suit you just fine. Do you fish for winter steelhead on the massive rivers of British Columbia or on the Washington coast? Chest waders are your best bet. Or, maybe you like to do a little of all three. If that is the case, definitely go with a pair of chest waders. They offer the highest versatility and are the most popular choice among anglers today. As a rule, it is smart to buy the best pair of waders you can afford. Quality waders will last longer and perform better than low-end, discount bin products. Shop around and look at the different options. Think about where you are going, how you will spend your time there, and how often you will be fishing. Consider the environment and take into account your own wading style and ability. Thinking about all these things beforehand will help you choose the best wading system for you and, more importantly, keep you safe and comfortable on the water.